Dawn and I took so many photos of Norway that I'm devoting an entire section to our trip together. Click here for pictures. I'm beginning to catch up on posting my photo adventures during the summer residency. I took a delightful jaunt on my last weekend off before graduation. Click here for pictures. Instead of a "blog" this year I'm posting more of a "backlog" of photos on-line. In fact, I've already finished my residency in Linz and graduated with my MFA. Hooray! I'll see if I can put together some pictures of the event later, but first I have other photos I'd like to share. I took a couple of weekend trips with friends from school to nice towns. Gmunden is an hour or so from Linz and is situated on a beautiful alpine lake. Click here for pictures. It's very expensive to fly directly to Linz from Scandinavia, so it was actually a better deal if I stopped over in Germany. Twist my arm! I love Berlin - the people are "echt" and I have a few friends there. I stayed in a funky place near their apartment in the Kreuzberg neighborhood where most of my not-so-very-famous tourist photos were taken. One day we biked all over the place - it was a lot of fun, but I didn't bring my camera. We visited 'the wild - wild east' where kids hang out on sidewalk cafes and smoke hookahs. It's bad enough smoking fruit flavored tobacco, but sharing it with friends? Yuck! I haven't included anything so exciting, but for some shots taken during a pleasant stroll: Click here for pictures. 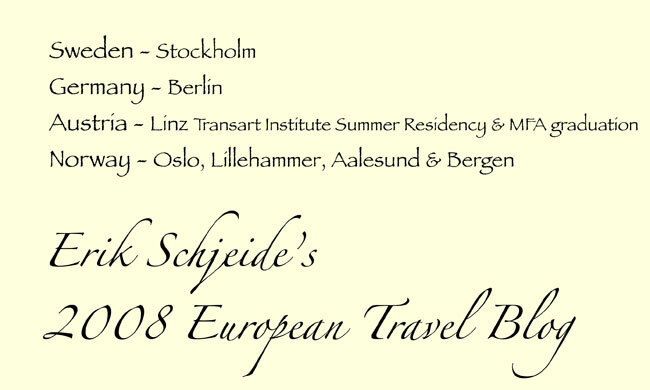 This summer Dawn and I have round-trip tickets to Oslo. She will meet me there August 3rd after I'm done with my residency in Linz and graduate with my MFA. The residency started on July 13, but I left a few days early to acclimate myself - a good thing because it took me quite awhile to get over my jet lag. I flew into Oslo July 7th and took a connecting flight to Stockholm. Although back in the 70's I had passed through different parts of Sweden, I had never been to this beautiful city. I lucked out with beautiful weather. It seemed like everyone was out and about shopping or hanging out at cafes and pubs. Click here for pictures.